Chelonia mydas, commonly known as the Green turtle, is a large sea turtle belonging to the family Cheloniidae. The range of the species extends throughout tropical and sub tropical seas with two distinct populations in the Atlantic and Pacific. With a flattened body, a beaked head at the end of a short neck, and paddle-like arms well-adapted for swimming, it derives its common name from the green fat underneath its shell. Adults are known to grow to 1.5 m long and the average weight of mature individuals is around 200 kilograms. Males are larger than females and neither can pull their heads inside their shells. The carapace of the turtle is known to have various colour patterns that change over time. Hatchlings are mostly black, while juveniles are dark brown and adults are entirely brown, spotted or marbled. Sea turtles spend almost all their lives submerged but must breathe air for the oxygen. With a single exhalation and rapid inhalation, sea turtles can quickly replace the air in their lungs. They can rest or sleep underwater for several hours at a time, but submergence time is much shorter while diving for food or to escape predators as their breath-holding ability is affected by activity and stress. Although their habitat is the sea, Pacific green turtles are known to crawl onto secluded beaches during the day to bask in the sun. The ecology of Chelonia mydas changes drastically with each succeeding stage of its life history. For instance, newly-emerged hatchlings are carnivorous and pelagic (ocean going), while immature juveniles and adult turtles are commonly found in sea-grass meadows closer inshore as herbivorous grazers. Green turtles migrate long distances between their chosen feeding sites and the exact beaches from where they hatched. Some C. mydas are known to swim distances of greater than 2,600 kms to reach their spawning grounds. Males and females mature between 10 and 24 years and nesting occurs every three to six years. When the female is ready to lay her eggs, she leaves the water, crawls onto the sand and starts digging for hours until her flippers will not allow her to dig deeper. She then lays 100 to 200 eggs, called a clutch, and covers them with sand to protect them from the sun’s heat and predators. The gestation period is 40 to 75 days, depending on the location, with the eggs hatching during the night and the newly-emerged turtles instinctively heading directly towards the water's edge. This is the most dangerous time in a turtle's life. As the hatchlings make their way to the water, various predators, such as gulls and crabs pick off many turtles and then there are many more predators in the water such as sharks, dolphin fish and kingfish. Juvenile green turtles spend from three to five years in the open ocean before they settle as immature juveniles into a more herbivorous, shallow-water lifestyle. It is speculated that they take twenty to fifty years to reach mature size. Unlike hatchlings, adult green turtles are large, well-protected animals and have few enemies and even fewer predators. Only human beings and the larger sharks are known to feed on C. mydas adults. Human practices in some countries result in turtles still being hunted for their flesh and their eggs collected from nests and eaten as a delicacy. Pollution indirectly harms turtle populations and many turtles die as a result of being caught in fishermen's nets. Habitat loss due to human development is a major reason for the decline of green turtle nesting beaches. 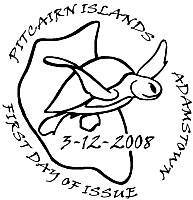 There is good news however - Chelonia mydas is listed on Appendix I of the Convention on International Trade in Endangered Species as of May 3, 2007. This cover by CITES makes it illegal to import or export, kill, capture or harass green turtles. In addition to management by global entities such as CITES and the IUCN (International Union for Conservation of Nature), specific countries around the world, under whose jurisdiction turtle nesting and feeding grounds are located, have undertaken specific conservation efforts in order to protect the species. 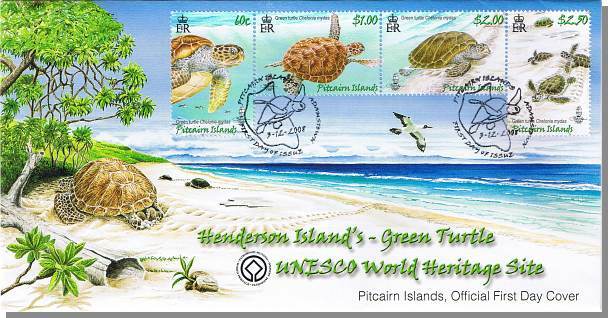 “To protect the intact status of the island’s geology, ecology and of its component flora and fauna - in particular threatened and endemic species, thus conserving the genetic differences between island populations, and the unique genetic contribution of Henderson Island to global diversity”. Containing superlative natural phenomena or areas of exceptional natural beauty and aesthetic importance. Containing the most important and significant natural habitats for in-situ conservation of biological diversity, including those containing threatened species of outstanding universal value from the point of view of science or conservation. Mini Sheet Size: 196mm x 83mm (Stamp Size: 42.58mm x 28.45mm). Format: 2 horizontal and 2 vertical setenant stamps. Denominations: 60c, $1.00, $2.00 and $2.50. 3 December 2008 for a period of 2 years.